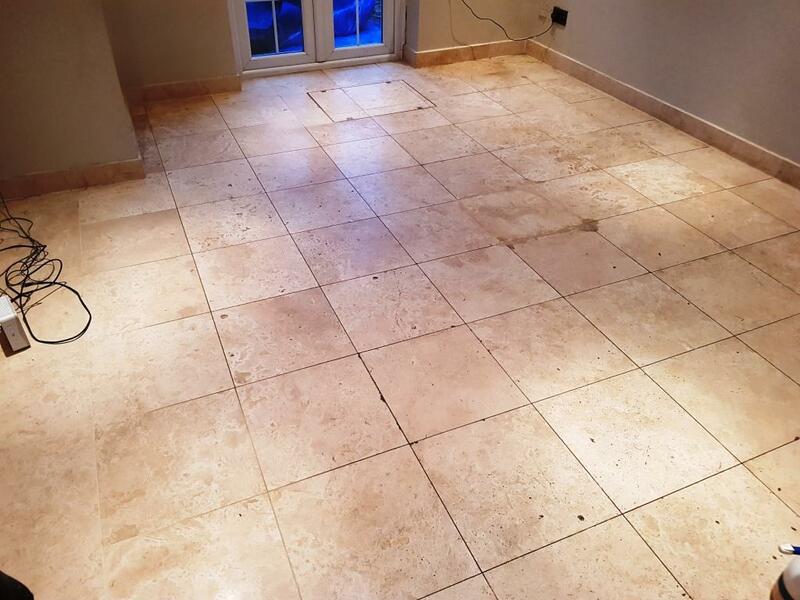 The Travertine tiled floor of this kitchen/family room in at a house in Welwyn Garden City, Hertfordshire needed some care and attention. As one of the busiest rooms of this family house, this floor had been ingrained with dirt from frequent foot traffic and required some minor repairs. Travertine is a natural stone material that has unique features and colouring that no other stone can offer. The distinctive natural designs and patterns found within Travertine make it very popular as a flooring material. Nowadays it is also often used as bathroom wall tiles and table tops. Travertine’s durability makes it ideal for residential installations however like all-natural stone it does need regular maintenance to keep it looking good. After discussing the floor with the owner over the phone I arranged a visit in-order to get a better look at the stone and to work out the best method for cleaning it. After inspecting the Travertine tiles, I concluded that the best way to restore the floor would be to use a set of diamond encrusted burnishing pads to hone and refine the surface of the stone floor and recover the original polished appearance. 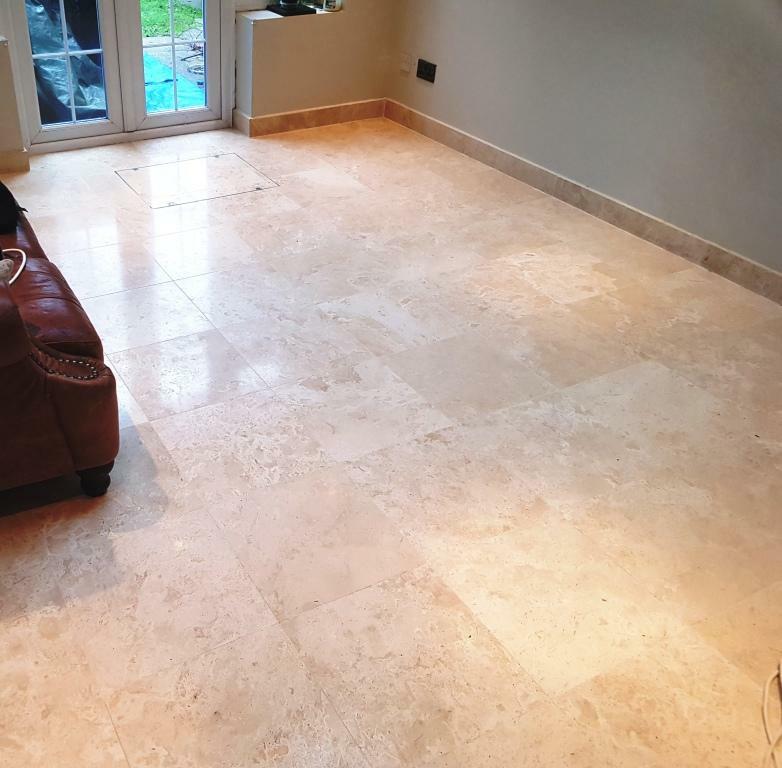 This is the process that we followed to bring back the natural lustre of the Travertine floor. * The door thresholds, skirtings, doors, kitchen fronts and plinths were protected with tape and furniture was relocated to other rooms as required. * A strong dilution of Tile Doctor Pro-Clean was mopped onto the floor and allowed to dwell for around 15 minutes. The cleaning solution was then worked into the tile and grout using a rotary floor machine fitted with a black scrubbing pad. We used finer detail pads and brushes for the trickier bits around the edges and also the grout lines. * The soiled cleaning solution was extracted off the floor with a wet vacuum and the floor rinsed thoroughly with water. * Once the floor had dried we carried out infill repairs with Limestone coloured grouts and stone resin. Following the initial clean we started with the five-stage diamond honing process using a set of Burnishing Pads. Lubricated with water this process uses a coarse pad to cut back through the tile to remove the etch marks and ingrained dirt, then by applying a series of finer grades of diamond pads it brings back a shinier finish. The pads are encrusted with industrial diamonds of different grades which are hard enough to polish the stone. We also used hand-held burnishing blocks in the tight corners and along the edges to ensure the whole floor was treated. The floor is rinsed with water between each stage and the resultant slurry is removed with a wet vacuum. We returned the following day. After ensuring the floor was clean and fully dry we moved on to the sealing process, the sealant ensures the floor has a nice durable finish and is protected from staining and ingrained dirt. When it comes to sealing Travertine I usually recommend an impregnating product called Tile Doctor Colour Grow which enhances the natural brown shades in the tile however the customer wanted the tiles to have a natural look to them so only one coats of Colour Grow was applied and this was followed by two coats of Tile Doctor Ultra Seal which gives the stone a natural finish. The completed floor now looks clean and fresh and a big improvement on how the stone and grout it looked when I first arrived. The family were very happy with the result and the new sealer will make the floor much more manageable going forward.